Tony Liu established the factory in shajing ---the biggest E cigarette production base in Shenzhen. We keep on high quality e cigarette. Founder Tony Liu changed our company name as Shenzhen Unitopcn Technology Co.,Ltd. The main markets are USA and Europe. 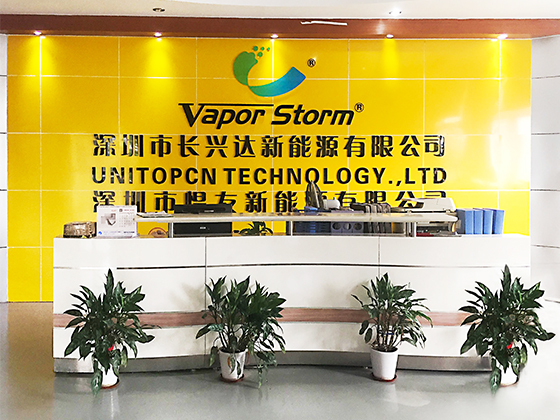 Unitop successfully registered vapor storm® Vstorm® and Ustorm®. At the same year, Unitop began to enter into the domestic mark and open the chain flagship stores in China. New products storm 50 storm 100 came into market. They are popular around the world because of unique and fashionable design. Sales volume occupied the top three of the domestic entity stores. Unitop led the new trend of Whole graffiti on E-cigarette box. Puma graffiti is hot sale at home and abroad. main markets are USA and Europe. ​Unitop has nearly 10 years of experience in electronic cigarette production and development, with 5000 square modern factory. From the first generation of simulation E cigarette to EGO, and then to box cigarette, we will never forget our original intention and strive to move forward. Through the fierce competition and industry reshuffle in e-cigarette, many factories have gone bankrupt, We have been insisting and never give up. At present, Unitop warehouse also keep many electronic cigarette products of different times. They are witnessing the history of the electronic cigarette industry, and also witness the development of UNITOP.